And zucchini. For some reason, he’s just not that into it. Early in our relationship (and my cooking experiments) I innocently tucked a few slices of zucchini in a vegetable lasagna. He asked me—truly disturbed—why I’d made the choice to put pickles in the pasta. Was the zucchini the best I’d ever had, or has it just been too long since my last taste? I picked perfect tiny ones at the farmer’s market—narrow, only six or seven inches long—figuring they’d be the most flavorful and sweet. They were fresh and herbal tasting, delicate and delicious. For half an hour, I hardly missed him. Put pasta water on to boil. Over low heat in a 6-qt saucepan or dutch oven, cook shallot and smashed garlic until shallot is clear. Cut zucchini into pencil-thick slices, then cut each slice in half lengthwise. Add zucchini to pan and stir. Season generously with salt. Cook over medium heat until tender, stirring often, about 15 minutes. Crack egg into a bowl and beat lightly. Add cheese and a grating of fresh nutmeg. Meawhile, cook pasta according to package directions until just al dente. When cooked, drain all but a few tablespoons of the water and add pasta and remaining water to zucchini pan. Turn off heat and toss quickly with egg and cheese mixture, not letting the egg scramble. Season with additional salt and pepper, plus more cheese if desired. really nice recipe. my roman friend is a vegetarian, she used to make smthg like this for us, called it pasta carbonara vegetariana. This post cracked me up! When my fella goes away I live off soup, because he’s not a big fan but it’s one of my faves. As for zuchinni, they’re brilliant in everything! i practically lived off them last summer when i was trying to slim down for my wedding…and THIS summer since there’s no white dress looming in my future, a creamy cheesy pasta with zukes sounds right up my alley! It’s funny because both my husband and I don’t really like zucchini (we’re totally meant to be!). I’m trying to get us to like it though and I might try this recipe out….but I’d definitely cut the zucchini into much smaller/thinner ribbons. I am a big fan of mixing egg with pasta like this. I do it with a variety of sauces - and with pesto is one of my favorites. Great recipe, I’m glad I found it. Is it bad that I saw the title and started giggling? My mind goes so easily into the gutter…. You, Shiv and my hubby need to form a sour cream/mayo haters club. I think you’d have no trouble recruiting members. I think I could even get my hubby to eat this delicious dish! Ooh, yum. I love zucchini in pasta. Good idea to add an egg! Oh, yay! I’m glad this one was as good as you’d hoped, and now I’m putting it on the list for the end-of-summer zucchini glut. My boyfriend is one of those no-cilantro types, but! We made guacamole with CSA cilantro last week and he ate at least 70% of it. I think he’s converted. I just made the original Marcella recipe for dinner on Tuesday. I was surprised how well what seemed like not much sauce coated the pasta. Great use of zucchini, and yours looks delicious! This is my kind of meal- fresh, simple, and delicious. Looks wonderful! 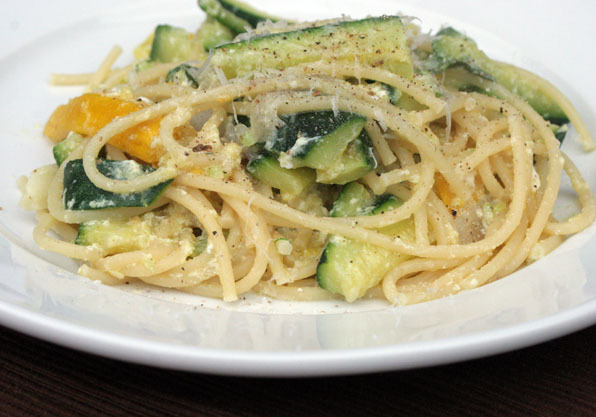 Lovely recipe — and what a great way to get back into the zucchini season. Enjoyed the Laurie Colwin reference with your title - it’s nice to have an evening where the only dinner you’re responsible for is yours, isn’t it? PS - have you tried fried zucchini? or breaded and cooked in a little oil? From this usually non-zucchini-lover, trust me: it’s the way to change a reluctant mind! Just like carbonara! I love zucchini. 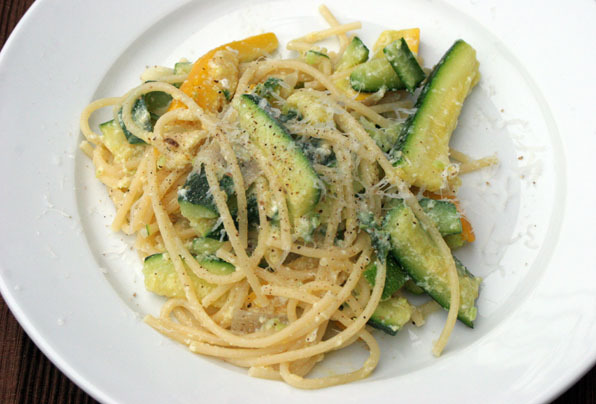 In fact, I just blogged about using zucchini to make “spaghetti pasta”, kind of like spaghetti squash! I love zucchini. Wow… the dish looks great, but a ticket to Rome—so jealous!! I love eating things Jim’s not crazy about when he’s away—usually it’s a pasta dish with lots of cinnamon and butter in it, a favorite of mine that he’s not into. I have the same problem with my husband, only re eggplant. He despises it. I still haven’t been able to win him over to the “dark side of vegetables” as he calls it. He does love zucchini and this is a great idea! Looks great. I have asked my wife to cook this for me this week. I love zucchini. This definitely sounds like a healthier version of carbonara. Can’t wait to get my hands on some zucchini at the farmers’ market! My husband won’t eat zucchini - he thinks! He loves my “mashed potatoes”! We often have “healthy gravy” as well. of a green cast; with the added greens, it is barely noticed. you will want to eat lots of it just for the healthful benefits.